Greek Pillar hopes to be the center of Greek life and facilitate how fraternity members interact with each other. I had the pleasure of meeting Greek Pillar co-founder JJ O’Brien at my first Startup Grind event. Before that, I went to meet Wayne Barz who helps run things over at Ben Franklin TechVentures on Lehigh University’s campus. It was an immersive experience, and I remember walking past the Greek Pillar office seeing JJ talking on the phone pacing back and forth talking a lot. I saw the passion of an entrepreneur in a way I haven’t seen it in a while – from the outside looking in. His feet moved a couple steps, and he turned around and did the same thing, his right hand held his phone by his ear while his left hand moved in circles in front of him, helping him articulate his point I’m sure. He was into it. I love seeing that passion, that desire to succeed – JJ is a winner. Greek Pillar changes everything fraternities do in terms of recruitment, and makes it better. The app is also rolling out some new features in the next couple weeks, and I am very excited to have the pleasure of introducing that. JJ O’Brien and Greg Potter set out in Spring 2015, both were Juniors at the time at Lehigh University. Their fraternity, Phi Delta Theta, was experiencing some issues with recruiting. JJ saw this as president, and when Greg took over he noticed it as well. Potter, a Computer Science student, developed an app which is Greek Pillar today. They instantly saw less headaches and reduced stress when it came to the recruiting environment. Lehigh has a student accelerator program called LaunchBay C, which Greek Pillar took part in. At this time the product was known as RushPillar. In only a few months they launched beta tests in Fall 2015, where JJ and Greg also won 1st place in the Lehigh University Baker Institute’s Eureka completion. Shortly after that they launched in January of 2016. 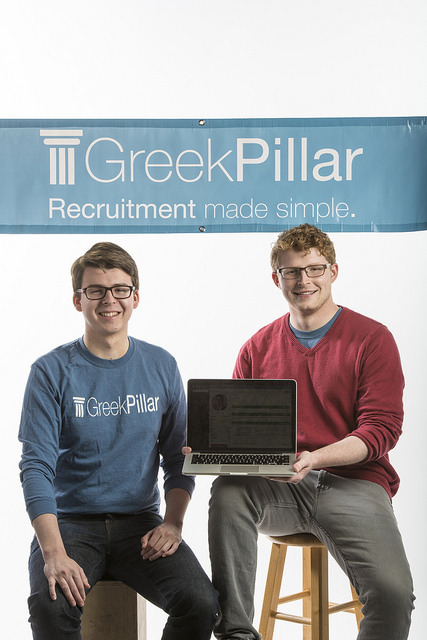 Since Greek Pillar’s launch, JJ and Greg received feedback from users and realized their customer base wanted a more immersive experience for greek life, basically not stopping at recruitment. Like any good business does, they heeded their customer’s advice and started putting time into expanding the scope of their project over this past summer. Greek Pillar will be happy to show you all the awesome changes in the next few weeks, but I’m not going to spoil the surprise. What I will say is they did market research on 350 different college campuses collecting data and receiving user feedback to develop the future of Greek Pillar. Greek Pillar is facing a couple obstacles. One is the goal of this company is to make money, which college students and fraternities don’t necessarily have a lot of or want to spend it. However, when one sees value, the rest is history. Also, on boarding new users has been an issue of the past which they want to solve. JJ states that this is their “main struggle.” Speaking with JJ I learned that there was a lot of communication to get things up and running, and instead of relying on this, it should all be automated. This way fraternities can do everything themselves via the app and not worry about anyone having to be the middle man. This is a common struggle for many companies in the early stages, and it’s all about learning and progressing. I truly believe that Greek Pillar is awesome. I don’t say this about every startup I come across. This is a unique idea that has positive feedback from the market. I see an issue when it comes to scaling, but there are a LOT of Universities, and fraternities at just about all of them. The hardest thing to do is getting it to different colleges. Once it is at a college, I could see the other frats pickup on it relatively quickly via word of mouth. The best way to do this? Go present at major Universities. I don’t have Greek Pillar’s full marketing plan, and I don’t expect them to show me it. If it were me I’d work on a specific area to start, allow it to gain more traction, and start pitching it to bigger schools from there to plant seeds in other areas of the country. The Lehigh Valley, where Greek Pillar is based, probably has close to 10, if not 10 colleges nearby that have fraternities. That’s a hell of a start, and it’s all within driving distance. Stay up to date with Greek Pillar to see the future of the product and how it evolves Greek Life!